TSA pat-downs got you down? Don't worry, these trips around the world won't require a flight! 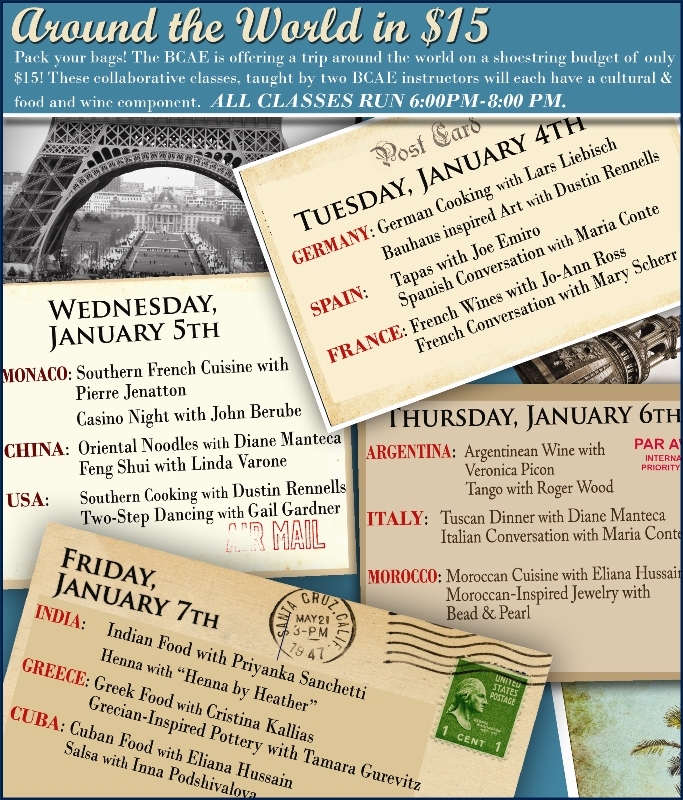 The Boston Center for Adult Education is livening up that cold first week of January with a series of classes highlighting the culinary and cultural aspects of twelve different countries. Each country's class has one portion about food or wine (such as German Cooking or Argentinean Wine) and one cultural portion (such as Two-Step Dancing or Feng Shui). These classes are being offered for $15 each - register here by clicking on the appropriate country name - and we have four admissions to give away, one for one class each night! Check out the schedule below, and keep reading to find out how to win! We're giving away one class admission (that's one class, two hours, about one country) for each night, so if you enter, please check the dates and let me know if there are any nights you definitely cannot make and any classes you'd prefer to attend if possible. I'll choose the four winners using a random number generator and then assign the nights as best as possible based on your preferences. Ways to win - do any or all of these! The first one is required; the rest are for extra fun (and entries)! You have until Friday, December 17th, at 9pm EST. Good luck, and have fun! UPDATE: This giveaway is now finished. View the winners here, and check the Giveaways page for more opportunities to win cool stuff!